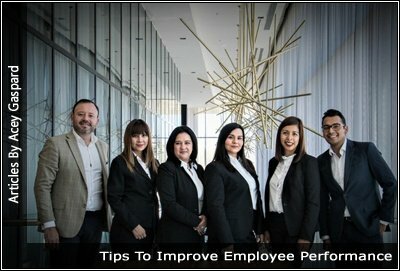 Here they are 24 simple tips that can help you start to improve employee Performance. Will they all work maybe, maybe not? See which ones appeal to you and start using them to see what results you will get. Incentives are one of the most effective ways to motivate your employees and increase overall performance. You may come up with a points system for merchandise, paid time off, as well as similar awards, or you can tie the incentives to monetary awards. When you are making decisions about employees, and you can share that decision, involve your staff. You will benefit because you will receive feedback, and you will be able to improve your idea. By including your staff in decisions, they may feel part of the team, become motivated and take more interest in their work. Some jobs are absolutely horrible and some not so bad. So, if you can’t eliminate the job, why not make it enjoyable or at least tolerable? Can you give the employee a TV to look at that won’t disrupt their work? Or maybe allow them to listen to music with headphones? Put your thinking cap on and find creative ways to make a bad job easier. One way to improve employee performance is to make their job easier. No one likes to be overwhelmed or come into work everyday to a headache. You can look at the position and come up with a list of ways to make the position easier. When you educate your employees on how their job affects operations and the importance of the job they are doing, they gain a better understanding of how their work is contributing to overall operations. Many people become motivated just because they understand they are making a contribution to the success of the operation. If they book an event in advance, do your best to accommodate them. Keep in mind they have a life outside work. People have different work habits. Keep an eye out for how people work, and give them some room. Someone may not be able to sit still, or someone may not be able to stand in one spot. Putting that person in a situation where they need to sit or stand will end up being counterproductive. When an employee comes up with an idea, they should get credit for their idea. This gives them validation and encourages them to come up with more ideas. When certain employees show interest in certain areas, get them more involved. They have already shown interest; it’s up to you if you want them more involved in that area. A raise every year allows your employees to look forward to something. You can increase pay by percentages and according to performance. A lot of people receive a pay increase every year to keep up with the cost of living. It’s important that your employees are paid well and receive at least the cost of living increase. Imagine your employees meeting with their friends and they bring up the topic of raises, and everyone receives a raise except your employee. You, as a boss, don’t look good, and your employee feels underappreciated and underpaid. When you have certain circumstances like a big project, heavy workload, or get a big contract, etc., you can offer your staff a bonus. A contest is a good way to motivate people and provide friendly competition in the workplace. Ensure the contest is fair and the results are achievable. Share your goals with your employees so that they know what you are shooting for and can help you achieve the goal. Sometimes, your staff members are not exactly sure of their role what they should be doing and what they shouldn’t be doing. When you clarify these issues, it will help your employees to do a better job because they have exact guidelines. You can’t put a square peg in a round hole, so you can’t expect a person that’s not suited for the job to do well in that position. You need to make sure the person is suited for the job. Even the top performers will have a difficult time working in a poor environment. If your workplace is hostile, contains a lot of tension, and is overall non-friendly, you will find it hard to stay positive, and negativity does not equal productivity. If your workplace environment is in need of attention, you need to fix it immediately. Have a weekly, monthly, or bi-monthly lunch event. You can have catering, order pizza, or even take your staff out. Do something you can afford, even coffee and donuts will show you care. During this event, be sure to join your staff and make it a social event. This improves the office environment and allows employees to social on company time. It’s important to have constant meetings with your staff to inform them of changes and progress, as well as allowing your staff members bring issues to the table. These meetings demonstrate you’re caring for your staff and the desire to ensure operations are going smoothly. Have a genuine interest in the life of your employees outside work. Find out about their family and interest and treat them a san acquaintance, not a number. Support them in their personal life when they need it. This helps build a strong relationship. Clear goals lead to clear actions. If your employees don’t understand your goals, they can’t reach the outcome you want. For employees who are underperforming, you need to find out why. You can’t just make assumptions. There could be reasons behind it like under-training, not liking the job, not understanding the job, etc. In order for your employees to perform well, they need to be trained well. Ask yourself this question: Have I trained my employee in a way that they can operate to optimal performance? Many times, the expectation of the job is not clear. Ensure that you are setting clear expectations of what is expected of your employees. With clear expectations, you have the opportunity to talk about expectations and why or why not they are being met. In many jobs, employees need tools to succeed. Have you given your employees the proper tools they need to succeed? Some examples include software, computers, stationery, machinery, etc.